A quick guide to the humble and delicious calçot and where to eat them. 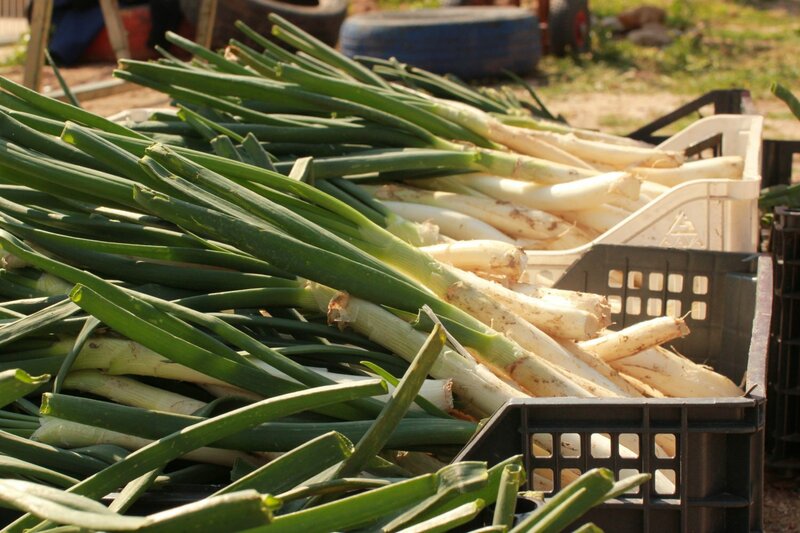 It's time for one of the more unusual fiestas on Ibiza - the celebration of the calçot, a mild green onion that looks like a cross between a leek and a spring onion. It's a delicious Catalan tradition that's spread to this island and when you taste this dish, you will know why the Ibizans don't want to miss out. The festival itself is called a calçotada and the most typical way of cooking the onions is to place over an open fire to make the inside soft and tender: this is the part you will pull out and eat. They are often served on a curved terracotta roof tile, devoured in huge quantities and accompanied by barbecued meats and plenty of wine. The calçot "season" on Ibiza usually finds restaurants offering them on menus on weekends from mid January to March, so now it's in full swing. The traditional method of eating the calçots is to dip them in romesco (almonds, tomatoes, garlic) sauce, dangle them high in the air and lower them into the mouth, sucking away at the sweet inner flesh. Don't be surprised if you are given a bib to wear. It's a messy business but you will have lots of fun in the process. Several restaurants across the island serve calçots in the traditional way - here are our picks. On Saturdays head to delightful rural restaurant Can Cires in San Mateo from midday onwards. It's run by a French national who has embraced local Ibizan cuisine, so expect great things. There's a children's play area outside and say hello to the the donkey and the resident parrot. One of the best places on Ibiza to celebrate a traditional calçotada is Bar Can Berri in the tiny hilltop village of San Agustin. This popular bar holds its event each Sunday from now till March. The place is usually buzzing with locals and there are live music bands every two weeks. If you don't want to be tied to one day, then head to Es Caliu on the famous "restaurant road" near Santa Eulalia and San Lorenzo. Calçots here are on demand so you'll have to call ahead and book. In winter it's open on Friday evenings, Saturday afternoons and evenings plus Sunday lunch. Weekends are made for relaxation, so check out these places for a yummy treat!